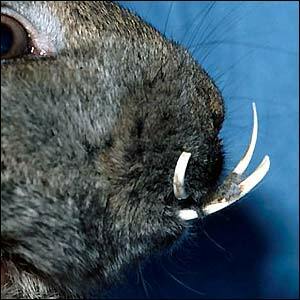 Rabbit teeth keep growing throughout the rabbit's whole life. It takes a lot of daily chewing and gnawing to keep them worn down to usable lengths. The top two teeth should overlap the bottom two teeth. This way, as the rabbit chews - hay, wood, bark, pellets, carrots, toys, your furniture - the teeth wear each other down evenly. 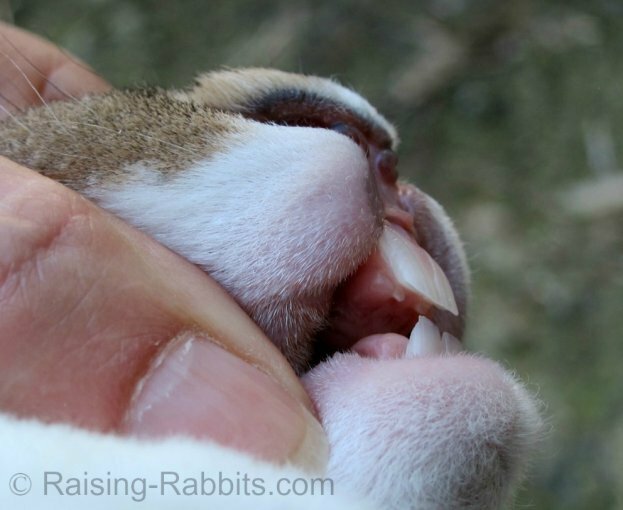 In addition to these front teeth, rabbits have two more teeth, called peg teeth, directly behind the two upper incisors, and a full set of molars in the back of the jaw which they use to masticate their high-fiber food. Malocclusion in youngsters is seen as early as 3 weeks of age, and varies in severity. The incisors may be frankly misaligned with the lower incisors protruding beyond the upper incisors. Or, they may abut straight on. Unless very severe, malocclusion in youngsters will frequently correct itself by 10 weeks old as the upper jaw catches up in growth to the lower jaw. This rabbit has perfectly aligned rabbit teeth. The little peg teeth behind the upper incisors are visible, and are what help chisel the lower incisors into proper wedges. Geneticists believe that malocclusion in youngsters is a heritable disease. Some controversy exists as to just how the inheritance occurs, whether caused by a simple recessive gene and additional modifiers, or several genes. Most researchers tend to accept the former. At any rate, a single recessive gene by itself does not explain the multiple degrees of genetic malocclusion. Whether genes or modifiers, it seems likely that several factors must 'align' in the genetic code of a rabbit in order to produce malocclusion, and if three or four conditions are suitable but a fifth is not, the rabbit will not present with malocclusion. But, breed this animal with 'perfect' teeth carrying malocclusion in 4 of 5 modifiers to a rabbit with 'perfect' teeth except for that single modifier the mate is missing, and you could be surprised by kits with frank malocclusion. This is the current hypothesis, anyways. Some rabbits develop buck teeth by yanking on the cage wire, disturbing the alignment in their teeth. This is not a genetic problem, but a physical one. Sometimes the resulting buck teeth condition is permanent, but sometimes the rabbit heals itself. Getting dropped and breaking the jaw can also result in malocclusion. Consult your rabbit-savvy vet. A more serious form of malocclusion occurs in adult rabbits, which may not be genetically related. Dietary problems such as not enough calcium, Vitamin D, or roughage can combine with too many calories, and cause a variety of problems. Calcium and Vitamin D deficiency can soften the facial bones, allowing the rabbit's teeth to eventually be pressured out of alignment in adulthood. Too many calories and not enough roughage may quickly contribute to not enough chewing, as the rabbit is soon satisfied. Malocclusion in older rabbits is frequently accompanied by other dental problems, such as abscesses, and overgrowth of the molars affecting the incisors and putting pressure on the tear ducts. Pet rabbits seem to be prone to adult-onset malocclusion. Spread the corners of the rabbit’s mouth into a smile, as in the first picture above. This reveals both the upper and the lower incisors. You want to see the uppers overlapping the lowers. In youngsters, if they abut exactly, the alignment may correct itself in a few weeks; check them again later. If the lower teeth meet the upper teeth on the outside, this may not self-correct. Keep a close eye on the rabbit. If this is an adult rabbit, you may already see that the teeth are growing too long. 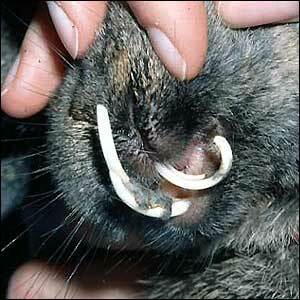 Rabbit teeth that are excessively long, usually with the lower teeth growing to the outside of the upper teeth. Pictured here is a very bad case of malocclusion. The teeth have been allowed to become severely overgrown. Since the teeth grow at a rate of roughly 1/2 inch per month, it only takes a few months for the teeth to become this overgrown. This animal probably cannot chew without a tooth digging into his flesh somewhere. Additionally, though not visible in this photo, the rabbit's molars in the back of its mouth may also be maloccluded and overgrowing due to improper alignment and inability of this rabbit to properly chew. 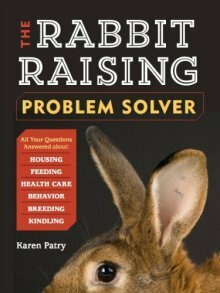 Is it possible to eliminate the genes for maloccluded rabbit teeth from the herd entirely? Malocclusion is usually a complex genetic syndrome. Rabbit breeders should cull all offspring that clearly exhibit buck teeth. But it is unlikely that the breeder can simply cull a few animals and call it a day. Since the jury is still out as to the exact mode of inheritance, you might want to repeat the breeding to settle the question of whether or not the buck teeth are genetic, or due to some injury, especially if just one rabbit in a litter turns up with crooked rabbit teeth. If the problem is indeed genetic, the breeder may wish to cull the parents, and then continuously select for breeding stock only those offspring with ideal alignment at 4-6 weeks. In much the same way as a breeder can nearly eliminate susceptibility to snuffles in his herd through consistent culling, we think the series of unknown genes or modifiers that together produce malocclusion can equally be eliminated. Just keep using for breeding the rabbits that have ideal teeth alignment. Yes, it might take a year or more, but many breeders have accomplished this task. 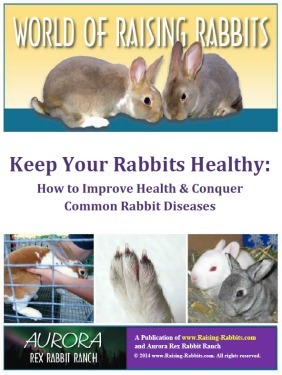 AT Home Pets Blog Post - Annette at AT Home Pets has posted an informative article on malocclusion in pet rabbits, linking to additional information. We recommend checking it out if you need to know more.